As featured in the Summer 2017 issue of The PRIDE alumni magazine. What makes St. Mark’s an extraordinary school? Different community members will give you a different answer: the world-class teachers, the state-of-the-art facilities, the rigorous academic curriculum, the focus on character education. Each answer is a part of the greater St. Mark’s experience. Each answer also provides insight into the results of decades of strategic planning. To prosper, every organization, from neighborhood churches to the largest global corporations, engages in strategic planning. This process allows leaders to collaborate with members of their community and decide on priorities that are both aspirational and achievable. For a school like St. Mark’s, this process is a chance to reflect on the things that matter most to the community and to plan how best to grow and thrive in the years to come. It is a chance to ask far-reaching questions like: what are the School’s priorities? Which areas should we focus on? What are the concrete steps necessary to achieve these priorities? In the early 1980s, the School faced these questions. Under the leadership of Trustees such as Robert Decherd ’69 and Robert Hoffman ’65, St. Mark’s set out to create a strategic plan, modeled after the successful Goals for Dallas of the 1960s. The result was Goals for St. Mark’s, a document that combined the priorities of the entire community and set forth a road map for the future. In the decades since Goals I first launched, much has changed. The physical campus has been, and will continue to be, transformed with new facilities. Classroom curriculum and campus programs have adapted to prepare boys for the modern world. And the student composition has become a diverse community of the best and brightest learners and leaders. One of the very first priorities of Goals for St. Mark’s I challenged the School “to ensure that any boy qualifying for admission to St. Mark’s and wanting to attend will not be prevented from doing so for financial reasons.” The resulting focus on financial aid and student accessibility has led to a student body that more thoroughly represents the world Marksmen will enter. Robert Decherd ’69 and Robert Hoffman ’65 celebrate the School’s 50th anniversary. Since that time, service to the community has become ingrained in St. Mark’s culture. The Community Service Program has grown into a major component of life on campus. Each year, Marksmen spend thousands of hours tutoring students at local schools, sorting items at the Salvation Army, and serving meals at Austin Street Center. Outside of the official program, students of all ages give their time to serve the community, organizing donation drives, teaching summer tutorial programs, and participating in the McDonald’s Week holiday fundraising drive. For the past four decades, Goals for St. Mark’s has provided a road map for the future. Goals II and Goals III, launched in 1990 and 2002, respectively, laid out steps for the School’s growth over the decades. The results of those steps are all across campus, some more visible than others. Nearburg Hall, the A. Earl Cullum, Jr., Alumni Commons and the W. W. Browning, Jr., Great Hall, a robust College Counseling Program, an active Alumni Association, and a more than $130 million endowment are just some fruits of the decades of labor driven by Goals. 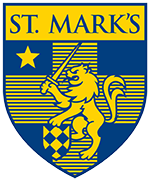 St. Mark’s has become a stronger and more impressive institution as the years have gone by, led by a committed administration and Board of Trustees with a clear strategic vision. Continual reflection and response is a process that must be repeated regularly for the School to continue to exceed expectations. A decade after Goals for St. Mark’s III launched, it was time once again to restart this process. The School celebrated the beginning of its second century with its most ambitious fundraising campaign to date, The Centennial Challenge, which secured more than $110 million in gifts. Soon after, David W. Dini was appointed the Eugene McDermott Headmaster. In 2015, David and his administrative team, together with the Board of Trustees under the leadership of President Taylor Wilson ’81, began planning Goals for St. Mark’s IV. A committee of community members formed to lead the listening phase of the project, and everyone from students and parents to teachers and alumni were invited to give feedback. The School partnered with a veteran strategic planning consultant and engaged with hundreds of community members through dozens of focus groups. Parents, alumni, students, faculty, and staff all shared which priorities matter most to them and where they saw the School’s future. “Here we are, a school that so often receives praise for being the gold standard, and in every meeting the questions were, ‘How can we be better? What school do we want to become? How do we get there?’ We are a school with so much to be proud of — and to be sure, the room was full of pride — but no one was resting on their laurels." After a full year of reflections and recommendations, the Administration and Board of Trustees collaborated on more than 50 drafts, arriving at a final document. While this document is now being unveiled, work is already underway to address many of its recommendations. The Science Center Project is under construction, the Character & Leadership program is continually expanding, and classroom curriculums are ever-evolving. Over the next few years, the other priorities will be addressed with a careful plan of execution. To be sure, no one at St. Mark’s is content to sit still.